At just 210g, the Roccat Noz is one of the lightest gaming headsets I’ve worn for quite some time. It’s also one of Roccat’s least flashy gaming headsets as well, as you won’t find a single LED on this £60 / $70 headset, or even their usual giant lion logo draped around the side of the ear cup. 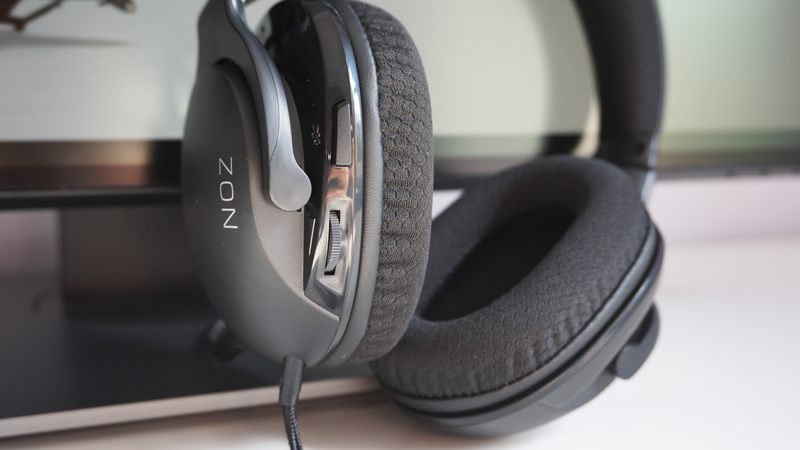 Instead, you just get a plain, black headset with a tiny amount of writing down the side, along with the briefest flashes of silver if you decide to extend its stainless steel headband. But does its compact, ultralight frame make it best gaming headset material? Here’s wot I think. Alas, despite its minuscule weight and lovely soft earcups, the Roccat Noz started pinching the sides of my head almost as soon as I put it on. I did, admittedly, have it on its tightest setting – as I often do, due to apparently having the tiniest head on the planet – but while lengthening the headband out a notch on each side did help alleviate the tension somewhat, loosening it any further then made it feel far too big, as if it was hanging off my skull like a droopy pair of elephant ears. As a result, I can’t see this being particularly comfortable for those with wider heads than mine, as even my micro-sized noggin struggled to find a comfortable position for it. It’s a shame, really, as the Noz’s audio quality was pretty decent. When I fired up Hellblade: Senua’s Sacrifice, the voices in Senua’s head were wonderfully crisp and clear, and I felt like I could pinpoint their exact locations as they rushed in close to whisper in my ear before dashing away again to snicker and laugh on the periphery. The Noz has two on-ear controls: a volume roller and a push-in microphone mute button. Sadly, there’s no way to tell whether the latter is activated other than shouting wildly into the void to see if your mates can hear you or not. I do like the reversible (or horizontal / vertical) styling of the word Noz, though. That’s neat. Similarly, Final Fantasy XV’s orchestral soundtrack proved to be very pleasant listening on the Noz. A tad clinical in places, perhaps, with some occasional string sections sounding a bit thin against the loud zips and zaps of battle, but on the whole I felt it struck a good balance between the highs and the lows. That said, the Noz is definitely better suited to some games than others. In Doom, for example, the lack of warmth I detected in Final Fantasy XV really came to the fore here, and everything from the game’s bass-heavy soundtrack to the pump and boom of the Super Shotgun just sounded very tinny and lacking in impact. No one wants weedy-sounding guns in a game like Doom, especially when part of the fun is tied to the specific noise and grunt of your arsenal. The Noz isn’t compatible with Roccat’s Swarm software either, so you can’t tinker with its equalizer settings to try and emphasise the bass a bit more for individual games. It’s disappointing the Noz isn’t a bit more versatile, as its detachable microphone also scored highly on the old clarity scale. There was a noticeable bit of background hiss when I recorded myself talking in Audacity, but the rest of my speech came through loud and clear without a single bit of pop or breathy wind fuzz. The Noz can also pull double duties on consoles and mobile devices, too, thanks to its bundled 3.5mm combo adapter. 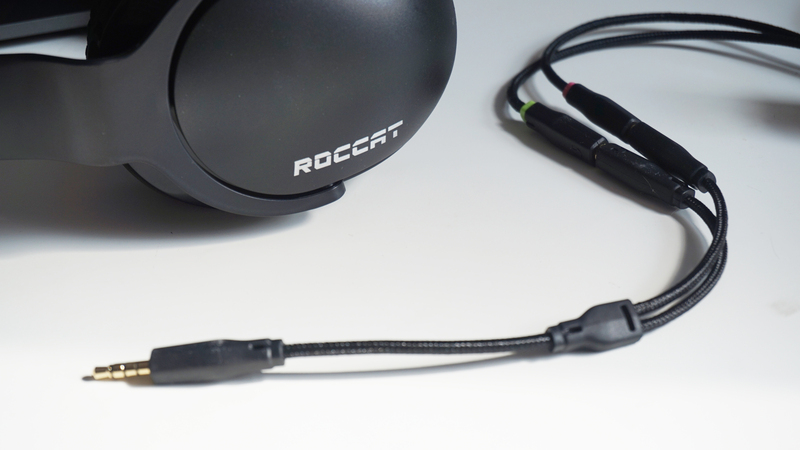 The Roccat Noz’s biggest downfall, though, is the price. While £60 / $70 isn’t extortionate in the world of gaming headsets, it’s also dangerously close to the vastly superior (and one of my best gaming headset picks) Corsair Void Pro RGB, which currently goes for £75 / $67 at time of writing (although the wireless version is oddly even less in the UK right now, going for just £67). This is eminently more comfortable than the Noz and produces a much warmer, richer sound across all types of games as well. There’s also the even cheaper Turtle Beach Atlas Three to consider as well, if USB headsets like the Void Pro aren’t your thing. This is currently just £48 in the UK (although weirdly doesn’t seem to be available in the US), and comes with a built-in bass amplifier to really up the ante for games and regular music alike. With competition like this, the Noz doesn’t stand a chance at this price. It may be ultralight, but it’s simply not enough to compete with the gaming headset heavyweights. Tagged with feature, Hardware, Headsets, Roccat.